Denis Villeneuve’s Sicario takes a look at the constantly escalating war against drug cartels at the border area between the U.S. and Mexico. 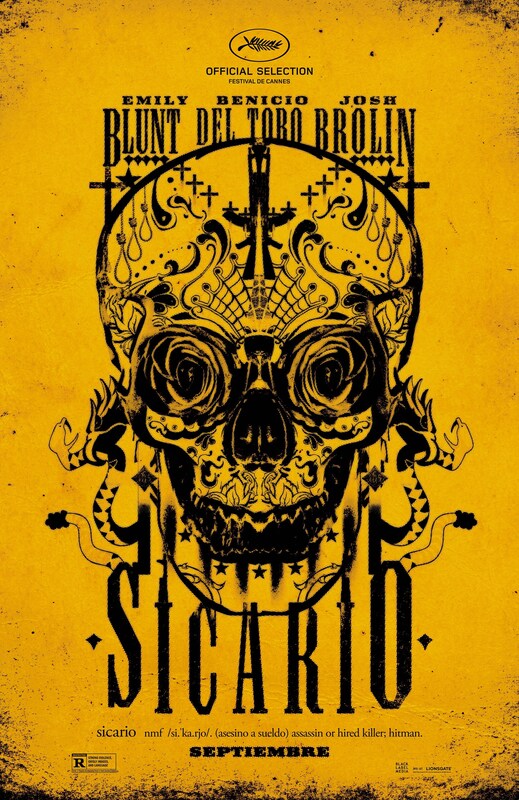 Sicario grips the audience right from the opening with a tense and memorable musical score that gives the audience an indication of what to expect from the experience. When this is coupled with the harrowing sequence that follows the whole thing stands out immediately. Immediately we see Emily Blunt’s Kate Macer involved in a raid on a house belonging to a Cartel member that quickly escalates into something shocking. The house is a graveyard for no less than 42 bodies belonging to those who dared cross the Cartel. Some hidden explosives make the situation even worse if you can believe it. Following this Kate and her partner Reggie (Daniel Kaluuya) are drafted into a multi-agency task force led by Josh Brolin’s Matt Graver and Benicio Del Toro’s Alejandro. The purpose of the task force is to unsettle a Cartel member enough so that he goes back to his boss and flushes him out. Due to the lack of ground being made against the Cartel the task force seem to have complete freedom to disregard standard procedure and use some very questionable tactics to bring that down. Kate serves as the audience avatar for this film so she is naturally horrified at these methods. She is portrayed as someone who believes in the law and the oath she took to uphold it so being involved in acts she is morally opposed to causes her to feel more than a little uneasy. Emily Blunt plays this perfectly. At the beginning of the film Kate feels overwhelmed by what she experiences and it gets worse the more she learns. She develops a smoking habit, questions everything she sees and does and generally seems to have a difficult time dealing with it. Her performance excellently shows the essence of a good person being stripped away bit by bit as she gets deeper into the dark world she is now a part of. Kate’s friendship with Reggie proves an effective counter to that and the only time she seems to be at ease is when she’s around them. Their chemistry works well on screen and they come across as old friends who have worked together a long time. In many scenes there’s almost a familial edge to their relationship and it’s always a joy to watch. Josh Brolin and Benicio Del Toro add a lot to this film as well but mainly exist on the fringes of Kate’s story. Both Brolin and Del Toro have so much charisma and their characters are appropriately nuanced. Their main purpose is to present an argument in favour of these extreme methods with Kate’s sense of morality clashing with that. The central conflict is fascinating to explore and the film never really takes a side as Kate becomes somewhat corrupted by the whole thing. It is never really suggested that either side is entirely right and strong arguments are made for both sides of the moral coin. The story itself is really well told and the central moral conflict makes it really easy to follow. I did feel there was a little bit of lag in the middle and occasionally I was unsure what the motivations of certain characters were but for the most part the narrative moves along nicely with plenty of tension throughout. It would be easy for a film like this to become preachy about the politics of the situation but Taylor Sheridan’s screenplay manages to stray away from that by presenting -what I imagine to be- real world facts about how little a difference is being made fighting against the Cartels. The message of the film if there is one basically boils down to “We’re not accomplishing anything, the stats don’t lie”. In terms of action the film is fairly light but it ably earns the rare set pieces with each of them feeling distinct and necessary. A lack of exposition really helps the mood and tone establish itself through what characters witness rather than what people are saying. Jóhann Jóhannsson’s wonderful tension creating score really helps with building the world and some beautiful cinematography clearly shows the scope of world this film inhabits with beautiful panning shots of the landscape. Having most of the film set during the day was a nice choice as it offers a clear contrast with the overall sense of bleakness and futility about the whole thing. This film is definitely worth a watch as it presents a lot of clever ideas in really sophisticated ways. The cast are all great and despite a slump in the pacing somewhere in the middle it moves along at a decent clip. A powerful film that manages to create a bleak atmosphere surrounding the ongoing costly war against the drug Cartels. Emily Blunt turns in a stellar performance as a woman drafted into this situation becoming very quickly overwhelmed by the shaky morality of it all. Her portrayal of a woman being slowly torn apart by all of this is fantastic to watch. The rest of the cast also do a great job with charismatic turns by Josh Brolin and Benicio Del Toro who add appropriate layers to their nuanced characters. Despite some slow pacing in the middle of the film the narrative moves along at a decent clip and the story is very well told throughout. Arguments are presented for both sides of the moral conflict but the film leaves the audience with the task of making up their own mind about it. The mood and tone are noticeably bleak with a real sense of futility throughout which provides a nice contrast with most of the film being set in daylight. The score and cinematography beautifully enhance everything this film is trying to achieve with some memorable musical cues that create great tension throughout as well as the scope of the situation being shown through sweeping panning shots of the landscape. I would absolutely recommend this film to anyone interested in this sort of thing. The cast are great, the story moves along well for the most part and the moral conflict is always clear and interesting.